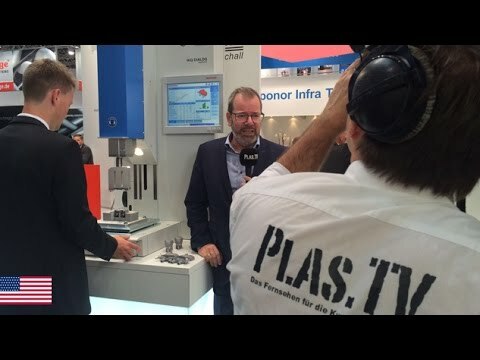 K2016 – a tour at the new Herrmann Ultraschall booth with Guido Marschall and his PLAS.TV film team. CEO Thomas Herrmann explains the exhibitions highlights at K-fair 2016 with twelve exhibits, seven of them demonstrating the realization of Industrie 4.0 in real networking machine systems. Here, customers can visit the booth and bring their real applications so the lab team can help them on the spot. At FAKUMA 2014, Herrmann Ultraschall is presenting a concept study on process linking with a touch sensitive small robot and a HiQ DIALOG series ultrasonic welding machine. Additional processes which are both upstream and downstream from the welding are to be brought together in the controls of the ultrasonic welding machine: Handling/feeding, testing, marking. The trend towards traceability is becoming stronger. This trend cannot be overlooked: Companies who weld thermoplastic parts using ultrasonics are increasingly inquiring about the integration of additional upstream and downstream processes that are combined in the control system of one single ultrasonic welding machine. The use of patented ultrasonic sealing technology helps to achieve significant material and energy savings. The gentle ultrasonic sealing process allows the use of thinner and less expensive packaging films because no additional hot sealing layer is needed in the film. Further, ultrasonic sealing produces narrower seals, which reduces the amount of material needed.